Room 5 is a large double bedroom situated on the first floor. Room 5 benefits from having one of our graciously large double glazed bay windows that overlooks the garden and are delightful to sit in and relax. Enjoy sitting in the bay window of Room 5 watching the sun set with a glass of wine – a perfect way to end the day. 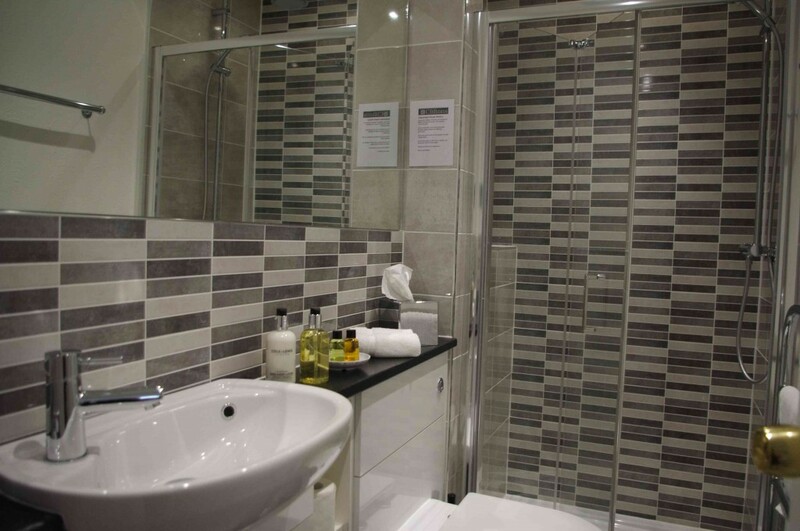 The bathroom was also renovated in 2017 with contemporary tiling and has a beautiful Grohe shower with two shower heads. The Cole & Lewis Company of London, UK designed toiletries, bring a truly inspired fresh look, with a quality and subtle combination of botanical extracts, which are used to great effect. An uplifting and sophisticated fragrant array of lemongrass, bergamot and lime stimulates the senses, while an exotic bend of coriander, eucalyptus and patchouli oils calm and moisturise the skin. There is also a local information pack and a map to help you explore. Please let us know if you would like recommendations for somewhere to eat. Also check our Places to Eat page for ideas. • Tea and coffee-making facilities. Varieties of tea normally include breakfast, chamomile, earl grey, peppermint and green tea. There is also decaffeinated coffee, normal coffee and hot chocolate.